If you’re looking to donate household items to charity, contact American Kidney Services or fill out our online form to be added to our rotational pick-up list. We’ll collect your used goods right from your home for free and use them to raise money for kidney disease patients. We’re a 501(c)3 charitable organization that raises money for the American Kidney Fund, a charity whose programs give direct financial assistant to kidney disease patients – and their families – who are struggling to pay their bills in addition to their costly medications and treatments. Dialysis, for example, is an expensive, recurring treatment that performs the vital functions of the kidneys, and many patients need it to survive but cannot afford to pay for it in addition to their rent, electric bill, car payment, and other necessities. Your donations to us turn into life-saving aid for people who are facing impossible circumstances. You can also arrange a special pickup of any larger items. And, if it’s more convenient for you, you can leave your donations at any of our hundreds of drop boxes. Plus, when you donate household items to charity, you not only support a good cause; you also help the environment by keeping still-good items out of landfills and by saving the world the energy and raw resources it would require to make brand new items. You give yourself the gift of a cleaner, more organized home, and – when the charity you donate to is a qualified 501(c)3 organization – you can earn a little of your taxes back. * Donating items is an all-around good thing. 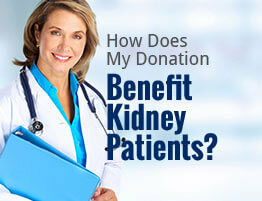 For more information about American Kidney Services, please contact us today.